Cosort is a software tool of high speed data sorting, helping for achieve an amazing velocity on Data ETL (Extraction, Transformation and Load). Parallel programming technology is the key factor,distributing the different tasks of data sorting and manipulation through several processors. Cosort applies to topmost companies that works with heavy volume sorting processes over open systems platforms, and looking for high quality, security and response time. Works mainly on LUW platforms (Linux,Unix,Windows) inside a great range of hardware platforms. SortCL a 4GL data definition and manipulation language is available for command line and batch processing with a Graphical User Interface (GUI) or inside applications. Data , load and reporting presentation in jobs, Perl and shell scripts, SQL procedures, ETL software and C, Java, VB and COBOL programming. 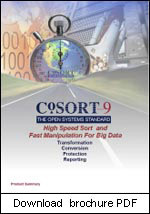 CoSort is key point in acceleration of ETL operations (Informatica and DataStage), data base reorg, SAS, Natural. We can utilize PlugIns and APIs (Application Programming Interface), or SortCL scripts. Cosort SortCL additional information Related to Information Security: Master data management, audit tool and CobIT (Control Objectives for Information and related Technology). High performance, reduced time and resource consumption, permits the completion of complex computer tasks in more than a half of the time, therefore in a short term a better use of company resources, generates major profitability.